The goal of Catholic education is heaven, but knowledge alone will not get us there! Virtues in Practice helps students to live out the faith in their everyday lives. 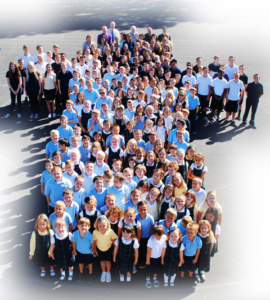 The whole school studies the same virtue each month, and primary, intermediate and middle school students learn about different saints who exemplify the month’s virtue. Virtue is not something just to know, but to DO. Virtues in Practice emphasizes role-playing in the classroom so that students can practice how to act when using a particular virtue. Monthly projects are designed to help students grow in the virtue of the month by practicing it in real situations. The Year of Faith focuses on Catholic devotions and the idea that “faith works” (Gal. 5:6), with a school-wide emphasis on service projects. The Year of Hope emphasizes study skills, because in order to fulfill God’s plan for our lives we need to develop the talents He has given to us. The Year of Charity emphasizes community, particularly in regard to students’ interactions with one another, because “he who does not love the brother whom he has seen cannot love God whom he has not seen” (1 Jn 4:20). The curriculum spirals, and every three years the same virtues are repeated with greater depth, and new saints are introduced as models of those virtues. For more information about the curriculum and resources to support your student’s participation, you may download the Virtues in Practice Parent Guide.